There are several different ways to share coordinates between disciplines. If you are working on a site/ landscape that does not have a building and you want to link in MEP, that can simply be done via Origin to Origin. This is how all of the building disciplines (Architecture, Structure, and MEP) link together by default and it is why Shared Coordinates are only necessary when you get out on to the site. Often, not all building files exist when the building is being sited. There is substantial room for human error when moving and rotating 5 building links at once. As such, I prefer to share Site coordinates only with Architecture, and then push out coordinates to the rest of the building from the Architecture file. To start out, you need to be in the architecture file, with Site coordinates already shared to Architecture (including the Location set to the shared Site). Also, you’ll want to have MEP already linked into Architecture and vice versa. In the Properties Browser, click on <Not Shared>. Change, Duplicate (the current Site), specify a name for the location, and Reconcile. Upon synchronizing (or saving), you will get a Location Position Changed prompt, select Save. But then (and this is important), click again on Shared Site (in Properties) and un-share the Site, by selecting “Do not share site of selected instances.” Click OK. The Architecture file is essentially pushing a snapshot of its current Location to the Electrical file. 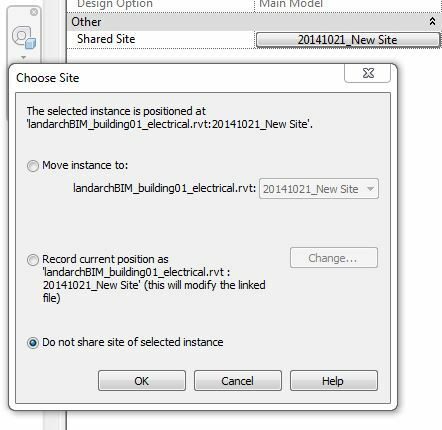 Once shared, Architecture does not want Electrical to be located (in the Architecture file) relative to the Site. Because if it is, if the building is ever moved and the Location is changed, the Site will move and the Electrical file will move with it. Obviously, this can cause all sorts of problems. So in the Architecture file, it is better to leave all building links as not shared. 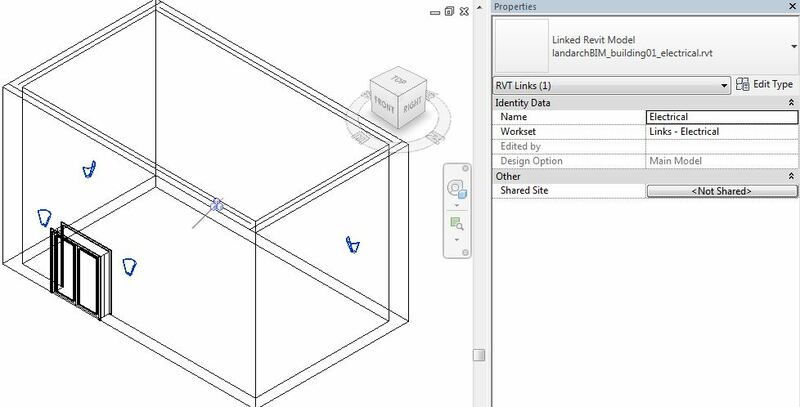 Once coordinates have been shared to Electrical, Site can now link in Electrical and Electrical can now link in Site. In the Site file, link in Electrical and set the Shared Site to the new Location. The electrical file will then jump into place. In Electrical, the Location must be changed to the New Site, link the Site and set the Shared Site to Internal. The site will then jump into place. The same can be done for all building discipline links. If the building ever moves, the entire process will have to be repeated, pushing the Site to Architecture, and then the new Location out to everyone else. Just remember to un-share all links within Architecture.